On this 5 days Ugandan Safari, you will explore wildlife in Queen Elizabeth National park and also do the memorable Gorilla trekking in Bwindi Impenetrable National Park. 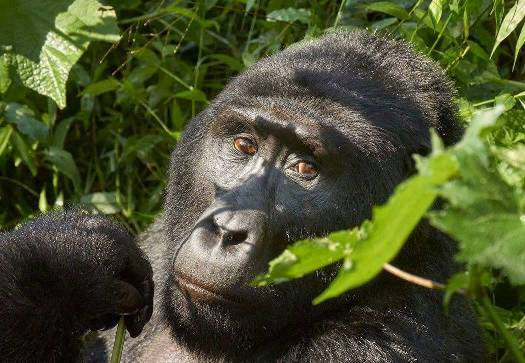 The safari will start in Kampala and then proceed to Bwindi Impenetrable for Gorilla tracking. 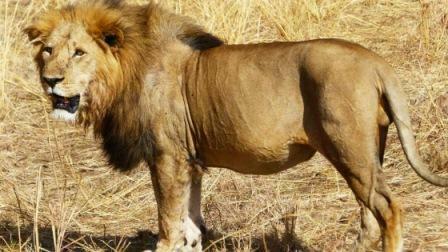 When the trekking experience is done, we will then move to Queen Elizabeth National park for a Big Four experience. Queen Elizabeth National park is a Ecological wonder. The park is blessed with wildlife including the Big four(Lions, Leopard, Elephant and Buffalo), Hyenas, Hippos, Crocodiles, Topi, Giant forest hogs, Warthogs, Uganda kob, Waterbuck, etc. Besides Game, the park is also an attraction for birds, Explosion crater lakes, Fresh water lakes like lake Edward and George. 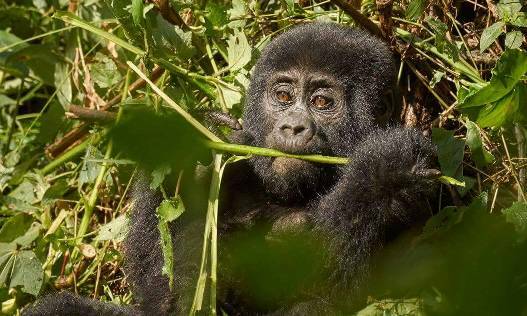 Bwindi Impenetrable forest is among the few places in the world where you can find Mountain Gorillas, The others being, Mgahinga Gorilla park, Volcanoes National park in Rwanda and Virunga National park in DR Congo. Gorilla trekking is a fascinating activity, you can move in the forest for hours before locating these giants. Gorilla keep on moving everyday depending on the availability and location of food. They move in groups, each group being led by a Silverback(a Dominant Male). Meet and greet your driver guide who is our company representative in the morning, have a short briefing about the safari and the highlights of the safari before setting off to Bwindi Impenetrable National Park. 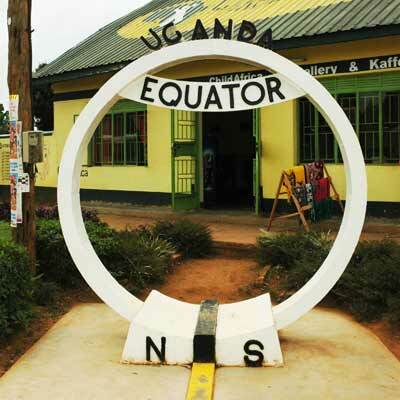 Along the way, you will have a stop at the Equator and get stretch of the legs, feel the zero line, have a cup of coffee or tea, you can also purchase souvenirs if you want. Continue south-west having a lunch stop in Mbarara, it is also called the land of milk, very famous for the long horned cattle “Ankole cow”. After lunch, enjoy the beautiful landscape, of hills and valleys of the pearl of Africa. We arrive in Bwindi Impenetrable National Park in the evening. Check in your lodge, and then dinner at the lodge. A early morning wake up accompanied with a hot breakfast you head to the park visitor centre for briefing. Here you will be divided into groups before tracking. Mountain gorilla tracking can be hectic but you being prepared makes the difference. With Packed lunch and enough drinking water you are good to go. Bwindi forest is more 250000 years old, just walk in such a forest is amazing. Your ranger guide will be in communication with the trackers for the exact location of the mountain gorilla this will ease you trek and you will find them quicker and when you do, spend 1 hour. Your ranger guide will do anything to make sure that you enjoy a life time experience with the mountain Gorillas. After an hour, you will return back to the visitor centre for graduation and then Dinner at the lodge. Day 3 of our 5 days Uganda Safari begins with a morning after breakfast and then you will drive through large green banana and tea plantations on your journey to the Queen Elizabeth national Park, because the land is generally flat, mechanization is possible, other cash crops grown in the region include; cotton, maize, sunflowers on season. Arriving at the lodge of hot lunch in the early afternoon. 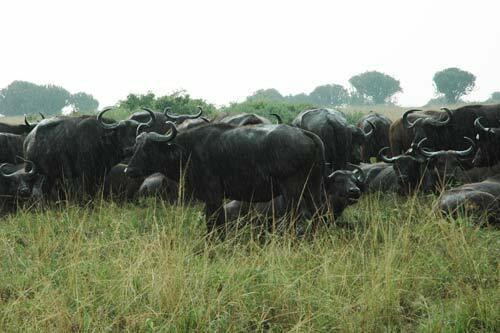 In the evening we set out for game drive in the park with a chance of seeing wildlife and sun set view in opening. We the return for dinner at the lodge. After an early morning breakfast, you set off for a morning game drive searching for game. 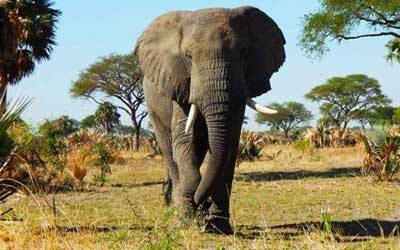 This is a good time of seeing almost every animals wild, such as; Elephants, Buffaloes, Hyenas, Giant forest hogs, Warthogs, Uganda kob, Waterbuck, with a plenty of birds; Marabou stock, Hamerkop, Lesser kestrel, African harrier hawk, Bateleur, just to mention but a few. Return to the lodge for lunch. 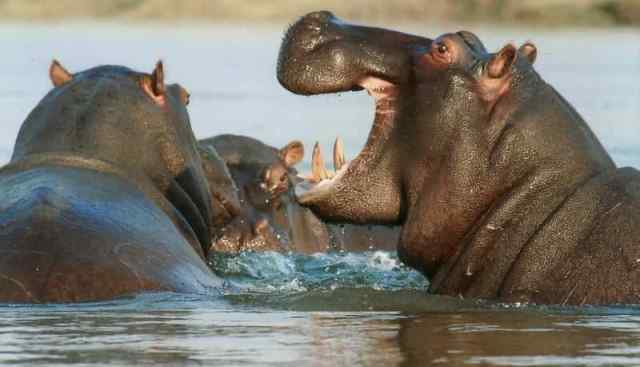 After lunch you will go for a boat ride along Kazinga channel where you will encounter a range of animals such as; the Nile crocodile, Monitor lizards, Hippopotamus, Buffaloes, a lot of water birds such as; little Grebe, African spoonbill, Great white pelican, Great Cormorant, African fish eagle, King fishers. Return to the lodge for dinner. In the morning have breakfast, check out, go for the scenic explosion crater drive. Volcanic reactions led to the formation of the craters though there is no much game animals, however the views are magnificent, crater drive can be substituted for a game drive in the Kasenyi plains for chance of seeing more game. After, depart for Kampala or Entebbe and have lunch on the way, then continue to Entebbe/Kampala for your flight hence ending our 5 days Uganda safari. Just like Rwenzori Mountain trekking, gorilla trekking also requires these items when tracking the gorillas. 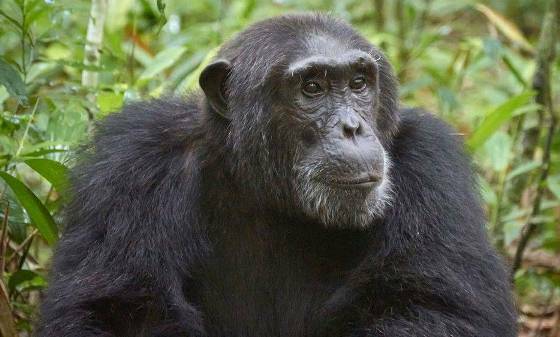 A 5 day Chimpanzee tracking, Uganda Lions, birding and wildlife Tour of Uganda in Queen Elizabeth and Kibale National Parks.